Victor Terrazas started Rejuvenate Therapeutic Massage with a clear mission in mind: Create the best wellness center in El Paso, Texas. As a licensed therapist and instructor with 17 years of experience, Victor had confidence in his ability change, enhance, and uplift his customers’ lives through top notch massage and wellness techniques. But when it came to marketing his new business, Victor was a little less sure of his approach. 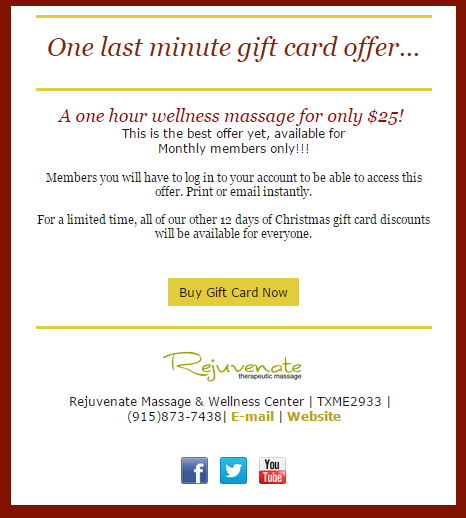 The Rejuvenate team uses in-house customized muscle therapy techniques. Not sure where to start, Victor reached out to a colleague to find out what tools they were using to reach new customers. That’s when he found out about two powerful marketing platforms — Constant Contact and MINDBODY. With Constant Contact’s email marketing tools, Victor discovered that he could reach his audience with professional emails and keep them up-to-date on upcoming classes and schedules. While Constant Contact helped Victor reach clients, an integration with online business management software MINDBODY allowed him to take it a step further and have clients book appointments and purchase classes online. Since then, Victor has used email marketing to grow his business and achieve his goals. In just two years, Victor’s contact list has grown from 40 names to over 650! Each time a new client books an appointment through MINDBODY, they are added to his contact list automatically. This helps Victor engage new customers right from the start and stay in touch with customers who have been with his business since the beginning. 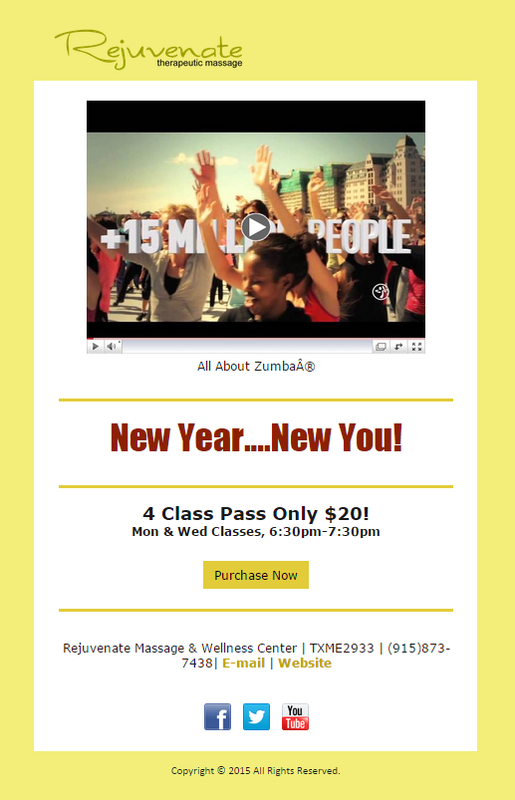 “Because MINDBODY integrates with Constant Contact all our new clients are automatically added to our contact list. That’s played a big part in helping us grow,” Victor explains. One of Victor’s favorite things about Constant Contact and MINDBODY is the time he’s able to save with these tools. While the learning curve of some marketing tools is pretty steep, Victor was pleasantly surprised at how much he was able to learn himself. Choosing one of Constant Contact’s professional email templates, Victor is able to complete an email from start to finish in a matter of minutes. Each time Victor sends out an email, he can be sure he’ll get a good response. Whether he wants to reward his email list with an exclusive discount or drive last-minute registration for an upcoming class, a quick email can go a long way in engaging his audience and boosting sales. To engage his contacts and inspire his audience to take action, Victor includes a combination of videos, images, and links. For Victor, the most important result is simple: “I would say the biggest result is building a relationship,” he says. In addition to using Constant Contact and MINDBODY for his own business, as a massage therapy instructor Victor has recently started teaching his students how to use these tools in their own pursuits. Keeping tabs on which emails performed well gives Victor insight into what his audience is interested in. For example, Victor recently noticed his click-through rate for an email announcing Zumba classes received 5 times the amount of clicks as an email about CPR training. These numbers give him valuable insight into which programs his audience is interested in and how well different classes will be received. Victor has also seen good results from providing his audience with timely offers. During the holiday season, Victor sent out a last-minute offer to drive end-of-year sales. Enticing his audience with an hour wellness massage at a discount price, Victor boosted his average open rate from 17% to 22%. Don’t let marketing be your business’s sore spot. Victor’s advice to other business owners is to try out different ideas and see what works best. “I’d say the best thing you can do is go for it! Be bold, and don’t be afraid to take some risks,” he says. With the help of Constant Contact and MINDBODY, you’ll connect with customers better than ever before and achieve the success you’ve been hoping for. Learn more about how Constant Contact can help you create and build customer relationships. Already a Constant Contact customer? Log in now to get started!